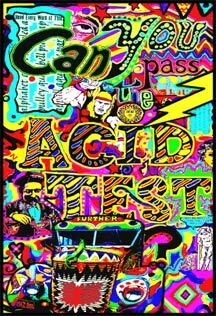 Videos and movies about Kesey, the Merry Pranksters, Acid Test, Cassady, the Beats, Leary and Grateful Dead! 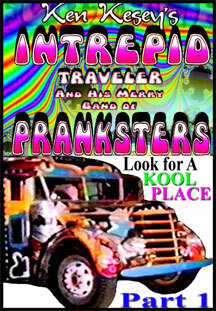 Produced, filmed, directed, edited and staring Ken Kesey and the Merry Pranksters. - It was 1964. Mercury sold a convertible. The Beatles wanted to hold your hand. Barry Goldwater was running for president. Hud was the best movie. A group of people were getting together on the West Coast. Ken Kesey had just written, "Sometimes A Great Notion." The publication party was to be in Madhattan the middle of June. The whole group decided to go. They bought a bus, painted it, outfitted it with a sound system, bought movie cameras and tape recorders, their plan: to film and record everything along the way, inter-acting with Americans, swilling big jugs of electric kool aid. When done, they would put out a feature film of the whole trip. Their fortunes and careers would be made. It didn't happen. Matching the film and the sound was too grueling. The whole thing was arrested. There were fits and starts, other attempts, but it wasn't until the digital age that the possibilities smiled and nodded. 35 years later, we achieve primal success. 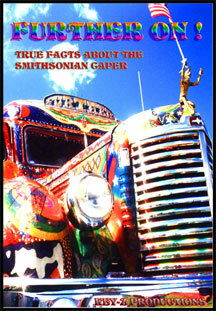 painting in California, the bus stuck in Arizona's Big Muddy River, the loss of a Prankster in Houston, Texas, the integration of Lake Ponchatrain in New Orleans, plus numerous wild adventures inside the bus, featuring Neal Cassady at the wheel, rapping and rolling. 56 MINUTES. HI FI STEREO PLUS: Bonus Stuff at the end of the tape! NEW DVD $25.00 (item DVD31) (SPECIAL TODAY $16.95) also see "Hassle Free" combo deal below! "Episode 2 is a little more than an hour, and it's pretty good. Not beatifically clumsy and surprisingly inspired like episode 1, but still pretty good. For one thing it's Cassady's best driving footage-- two cameras on him and words finally fitted accurately to his whirring lips. His face is healthy and tight and his rap righteous, and his spirit is flying. And his mind? Terrific. Vintage Speed Limit. In episode 1 when Cassady first comes driving over the bridge to our place in La Honda, you hear him before you see him, jabbering over the exhausted vehicle and the scratchy old radio-- talking us stuff that you can't make out until he turns off the car and the radio. And as soon as the song stops you realize it was Love Potion No. 9. A charming little entrance for Neal at the Wheel-- The 1960's Acid Anthem. Then in this 2nd episode he resumes this theme, driving the freeway and slipping into the subject just as the stuff begins to buzz through our brains. It's a wonderful frill of words-- "Strict!" he says. "It's strict! Strict, uh, as they say in 'Arsenic and Old Lace'-- it's strict-nine...strict-uh-nine...nine... Look! Sign! ....says it's nine miles to exit nine... nine... number nine..."
Then he begins singing in that low vaudevillian voice he used when he wanted to make a profound pronouncement but didn't want anybody to get real serious or hung up or brought down-- "And we mixed up a bottle of-- Love Potion No. 9 doop de doodle doodle dee...."
But it makes you think." 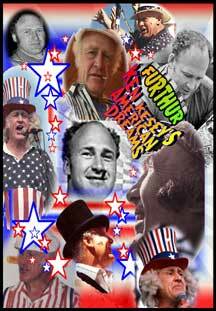 Produced, filmed, directed, edited and staring Ken Kesey and the Merry Pranksters. This was Kesey's final project! NEW DVD $25.00 (item DVD32) (SPECIAL TODAY $16.95) also see "Hassle Free" combo deal below! Refurbished and reedited by Zane Kesey and Simon Babbs using state-of-the-art "toys". This dramatic quality difference is from re-transferring original film and audio from the Merry Prankster vaults in Hollywood. Featuring added scenes, new songs, new interviews, and now synched sound. Featuring the Dead (Pigpen, Jerry, Bobby, Phil and Bill), Ken and the Merry Pranksters (Cowboy Neal, Mountain Girl, Babbs, Hassler, Betsy Flagg, George Walker, Gretchen Fetchin and of course Owsley, the man behind the stereo and the electric punch). In this special "Directors Cut" the Prankster pose as moviemakers, "simply shooting a party scene". Their planning is interrupted en-route to the event, to hide the stash, because a patrol car has spotted Furthur. Pigpen improvises as the amplifiers around the room find "Power". Naturally you are treated to plenty of Dead (Warlock) classics and Prankster craziness. As the night builds, and the Kool-Aid kicks in, newly crystallized minds melt with the colors and music. Eventually the Ballroom manager attempts unplugging this electronic mayhem, but they can't see to turn anything or anybody "off". This exiting slice of history is everything Tom Wolfe wrote about, and more (like Jerry sweeping up after the show). NEW DVD $25.00 (item DVD02) (SPECIAL TODAY $16.95) also see "Hassle Free" combo deal below! In the late 1980's Ken Kesey called his editor about his upcoming book "The Further Inquiry." He wanted film of Neal Cassady to be added to the book in the form of flip pictures (they move as you flip through the pages of the book). His editor said that was impossibly expensive but jokingly said that he would do it if Ken brought Further (the 1939 school bus decaying in his field) to the American Booksellers Association Convention in Las Vegas. Ken simply answered "OK, he will bring Further....He had spotted another bus for sale the day before and had been itching to have a new bus lately, as it had been 30 years since the last one died. He bought the bus, fixed it up and began painting it in wild colors. The local news happened to come to the farm and filmed some of the progress of this new project. That night the news reported that "Ken Kesey has restored the original 1937 bus and is taking it to the Smithsonian Institution Museum". 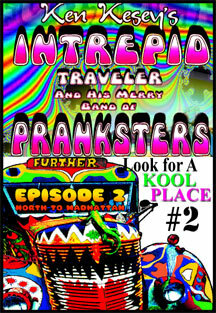 Even the Merry Prankster himself could not have dreamed up such a perfect prank, soon network television crews, newspaper and magazine reporters were showing up asking if they could come along for the ride...Ken said "SURE...get on the bus" This video chronicles a new chapter in the legacy of Kesey, the Merry Pranksters the psychedelic bus, FURTHER. Staring Ken and the Pranksters with special guests Timothy Leary, Robert Hunter, Hunter S. Thompson, Bill Walton, The Grateful Dead, John Barlow, and a cast of thousands...all caught in the web of the greatest prank ever. NEW DVD $25.00 (item DVD38) (SPECIAL TODAY $16.95) also see "Hassle Free" combo deal below! In 1997 Ken came up with the wildest idea for a party since the Acid Test. The idea was to transform a room into a Time-Machine, transporting the audience from reality to. . . anyplace else. The Merry Pranksters were enlisted to help pull off this mind altering feat. The Timeroom itself was filled with transparent films painted with Day-Glo space designs, with psychedelic liquid lights projected onto them. Ken and the Pranksters were in front sitting around their "Timetable." The Timetable was equipped with headphones for each of the Time Navigators (The Merry Pranksters) so that they could communicate in the moment and spread their weirdness amongst each other, as well as broadcast it to the crowd. Multi-media images were being shown of historic events in time, these images were mixed in with the camera aimed at our Merry navigators. The combined video images were then projected onto a large screen behind the Timetable, bombarding the audience with chaotic colors and swirling images both past and present . The result was fun-filled chaos, with plenty of Prankster silliness. 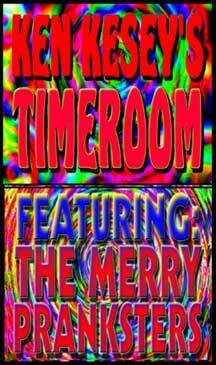 The video was also recorded as it was shown, giving a chance for you to see the wildness of the Timeroom for yourself. The Timeroom was a huge success, leaving the audience bewildered and enthralled, but maybe in need of some aspirin by the end of the night. Approximate running time 55 minutes. NEW DVD $25.00 (item DVD35) (SPECIAL TODAY $16.95) also see "Hassle Free" combo deal below! 1986, approx. 99 min. On the road with the Thunder Machine Band, it's Ken at his best. This electric video captures the spirit of Ken and brings it to you. 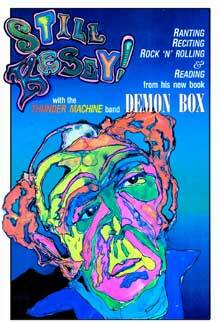 In Still Kesey, Ken reads several selections from his book Demon Box. The first selection "Now We Know How Many Holes it Takes to Fill In the Albert Hall", details Ken's reaction to the death of John Lennon, recounting three "visitations" that Ken experienced before and after the assassination. 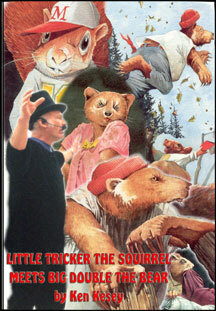 The second selection entitled Little Tricker the Squirrel Meets Big Double the Bear is a timeless tale both written and told to you by Ken. "Tricker" has already become a classic and the way Ken delivers the story is not to be missed. For the last 20 minutes or so Ken slips into his alter-ego "Uncle Sam Bozo" and sings a medley of his "greatest hits" with the Thunder Machine Band - a very eclectic group of musicians. The climax of the musical performance, and the end of the video, includes some very special musical guests. 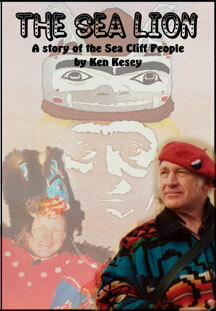 Still Kesey is a warm, funny video which is the next best thing to seeing Ken in person. "It's like that feeling when you're a kid on a carnival ride." - Washington Post. 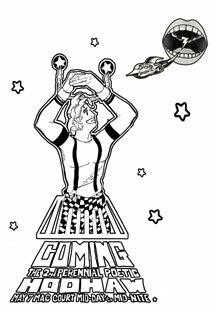 "Kesey fascinates his audience with his delivery ... animated and cagey." - New York Times. "Five thousand people applauded for five minutes." - Wall Street Journal. NEW DVD $25.00 (item DVD03) (SPECIAL TODAY $16.95) also see "Hassle Free" combo deal below! In the mid 1990's Ken wrote a play to save the world a end of the millennium...really! He saw that people everywhere had grown apathetic and become merely audiences. What he created was an interactive “ritual reality”, bringing the Prankster/actors into the audience and asking the audience onto the stage. He planned to evoke chaos in order to quell the natural disasters coming at the end of the millennium. For a task as important as this he needed some big names...so the play is set in the land of OZ. Ken is the Wizard and he conjures up unwilling characters from log ago....Dorothy, the Tinman, Scarecow, Glenda...and soon they are confronted with unearthly characters such as Elvis, Legba and Frankenstein. The wizard leads the Dorothy along, learning new lessons with each character until the play unravels with bickering and battles as the chaos starts. Soon the disgusted cast demand that Kesey come down from his cloud and confront them. I won’t give away the surprise ending, that sends the whole building into a rock-n-roll party with Jambay providing the tunes and the audience becoming Merry Pranksters. This play was very important to Ken, as he poured his soul into it, taking it on tour, editing this video, even creating a club (L.O.S.T. Legion Of The Sufficiently Twisted) with secret handshake and ID cards. This video is now being offered again for a limited time, because Ken would want it that way! 2 hours 10 min. NEW DVD $25.00 (item DVD36) (SPECIAL TODAY $16.95) also see "Hassle Free" combo deal below! is Kesey's own, told in a vigorous, colorful style that demon-strates how much new life can be breathed into old stories with rich and vital language. His style brings each character into sharp focus as Tricker shrewdly calculates, a simple rough-hewn bully with far more brawn than brains. NEW DVD $25.00 (item DVD39) (SPECIAL TODAY $16.95) also see "Hassle Free" combo deal below! This is a very intimate evening with Ken reading to grandchildren by candlelight. It is the first time anyone has heard this story...and (as he says) "it is a thousand years old". Upstairs in his log barn that looks very much like a longhouse in the low light, Ken tells his new tale. The Sea Lion. It is a Northwest Indian story about young Eemook, the Sea Cliff Tribe's crippled spoonmaker. Lowly Eemook was nearly cast into the sea at birth because his mother has died, but was spared by the chief. The misshapen boy achieves manhood by piercing the veil of enchantment laid upon his tribe by an evil and powerful spirit. Kesey paints vivid portraits with his words: revealing Eemook as lively and courageous; fiercely jealous Chief Gawgawnee; Shoola, his daughter, whose friendship with Eemook defies her father's command; and Um-Lalagic, the boy's adoptive grandmother, who makes shadow dances to soothe children and sees truth clearly. Kesey's text is rhythmic and powerful with sinewy strength in the narrative. Although this tale is told in the tradition of the Northwest Indians rather than coming from their lore, it weaves a powerful spell that leads readers to a magical sense of time and place. NEW DVD $25.00 (item DVD40) (SPECIAL TODAY $16.95) also see "Hassle Free" combo deal below! springtime on the University of Oregon campus "Mid-day to mid-nite, bring a blanket, a buddy, and a bongo". This highlight videwo includes the poet party at the Kesy Farm. This video has come back out of the vaults due to popular demand. NEW DVD $25.00 (item DVD37) (SPECIAL TODAY $16.95) also see "Hassle Free" combo deal below! If you order over $50 dollars worth of DVDs from key-z.com, you may ask for this FREE DVD "FURTHUR, KEN KESEY'S AMERICAN DREAMS". We now also have FURTHURMORE, the sequel documentary. To order just add this item onto the order form as Item #DVDfree, with a description of of which one you want. 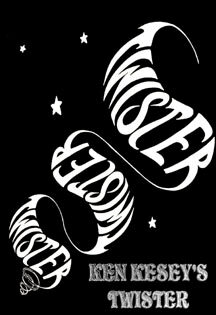 This is the best documentary ever done on Ken Kesey period... that should be all you need to know!